NVI Field Orientation Oct 2017 from Josie Byington on Vimeo. 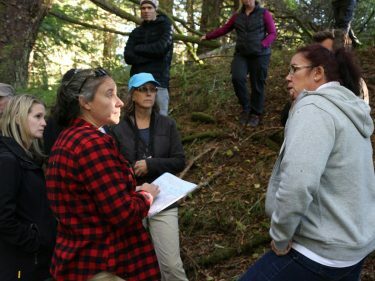 A very productive field orientation for MaPP North Vancouver Island implementation team members and guests occurred over three days in early October 2017 through parts of the traditional territories of the Mamalilikulla, K’omoks, Tlowitsis and Da’naxda’xw Awaetlala First Nations. Hosted by Chief Richard Sumner of the Mamalilikulla Nation and guided by guardians from the four First Nations, the group included staff from the Ministry of Indigenous Relations and Reconciliation (MIRR), the Archaeology Branch of the Ministry of Forests, Lands, Natural Resource Operations and Rural Development (FLNRO), two archaeological consultants and an economic development consultant. The focus of the tour was to increase awareness of the role of guardians as well as some of the Aboriginal tourism and archaeological site protection challenges and opportunities in the territories. 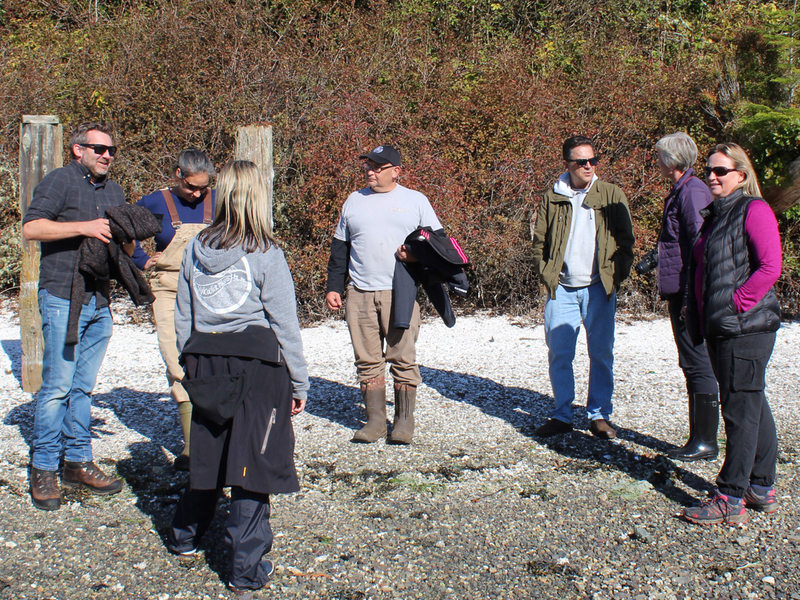 During the orientation, participants saw, first-hand, the implementation of strategies developed in the NVI marine plan, like the shellfish aquaculture pilot project. The trip also allowed the team to discuss ideas on how to ensure First Nations inclusion in the management and protection of cultural sites/areas. Coastal guardians describe themselves as the “eyes and ears of the land and sea” as they conduct patrols almost daily to assist in protection of ecosystems and cultural heritage resources within their traditional territories. They conduct ecological monitoring, promote compliance through their presence on the water and provide data to support enforcement activities. Guardians work with agencies and organizations such as BC Parks, Parks Canada, Department of Fisheries and Oceans, and local stewardship groups. Coastal guardians have an important and evolving role in implementing the NVI marine plan that currently includes collection of ecosystem and cultural heritage data. 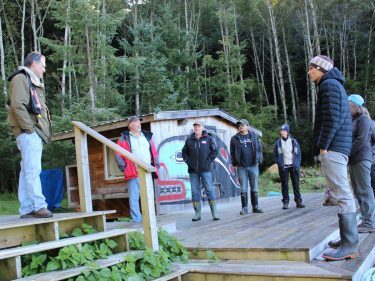 Following a brief safety and logistics meeting at the Nanwakolas Council office in Campbell River, the group split up and travelled to two different departure points, Sayward and Telegraph Cove. The first day of the trip focused on orientation to vulnerable and sensitive archaeological sites in the First Nation territories and an inspection of the Tlowitsis shellfish aquaculture pilot project. Greg Johnson of Nanwakolas Council inspects trays of oysters at the shellfish aquaculture pilot project site. Photo credit: Barb Dinning. 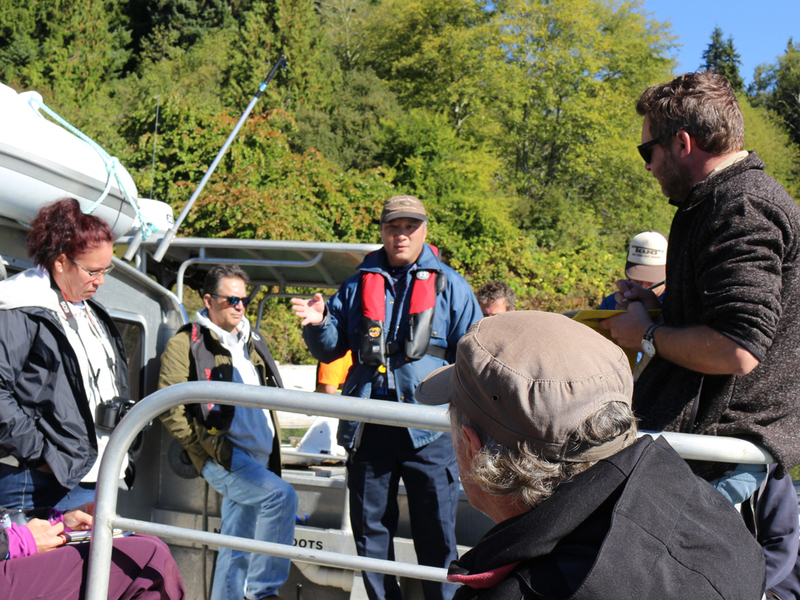 The Tlowitsis guardian boat left Sayward with four group members and stopped in Port Neville to view the shellfish aquaculture pilot project located there. The project is an experimental grow-out of blue mussels, scallops and oysters for two years to determine viability of the species for commercial development. 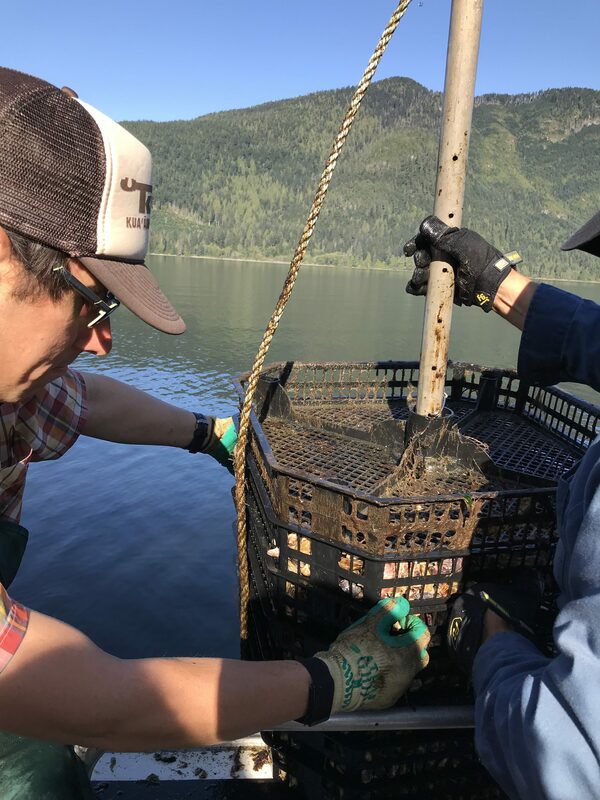 The group inspected the trays and nets containing the young shellfish suspended along an array of nine buoys. The pilot project also includes data loggers that measure ocean salinity and temperature at the site and two other locations. Next, the group visited a site to view petroglyphs and a midden in Port Neville and then travelled north, stopping to view priority archaeological sites including pictographs and village sites at different locations and learning about the Tlowitsis traditional way of life from its Nation’s Guardians. Chief Richard Sumner describes the midden and the buildings that once stood at this site on Village Island. Photo credit: Scott Harris. Other field trip members departed from Telegraph Cove aboard the K’omoks and Mamalilikulla guardian boats and visited the Broughton Archipelago where Chief Sumner provided examples of archaeological sites of high sensitivity and vulnerability. Chief Sumner was very concerned about one site in particular and showed the group how a sign discouraging people from visiting the area is actually having the opposite effect. The Mamalilikulla Guardians have noted a number of tourists this past summer using the trail to a Mamalilikulla sacred site. The two groups and the Da’naxda’xw Awaetlala Guardian boat carrying a consultant archaeologist met at Village Island and hiked to the site of Meem Quam Leese village. Chief Sumner described life at the village, abandoned in the 1960s, which is currently visited annually by about 800 kayakers. He discussed plans to replace the dock and clear brush from the village site to enhance the experience for tourists. The group members discussed options for protection of the site, such as educational signage and establishing a permanent guardian field station for the Mamalilikulla. The Chief pointed out several cinder block burial boxes on nearby islands that were installed to protect human remains. Over the past 50 years, the islands had been robbed of hundreds of burial boxes and human skulls. Tlowitsis Guardian Gina Thomas (right) discusses options for the protection of archaeological sites with provincial staff members. Photo credit: Josie Byington. The boats then travelled to Kalogwis and other sites in Tlowitsis traditional territory to view sensitive and vulnerable archaeological sites, including pictographs, village sites and middens. The first day of the field trip concluded at Tsatsisnukwomi Village, or “New Vancouver,” where all members of the group were hosted to dinner and exchanged information about the work they do relative to the NVI MaPP area. Day two of the field trip focused on Aboriginal tourism and economic development. It began with a tour of Tsatsisnukwomi Village, including visiting the big house, which contained regalia and artifacts on display. The guide described the dances and sequence of a potlatch. Guardians at the village provide similar tours and accommodation for visitors each summer. Chief Richard Sumner shares ideas for tourism development on Compton Island. Photo credit: Scott Harris. The group travelled to Compton Island, in the Broughton Archipelago, where Chief Sumner provided his vision for tourism development there. Economic development consultant, Tony Wong, discussed his findings about economic development opportunities and constraints for the NVI sub-region. During the discussions, the new National Geographic ship, Venture, paused in front of the island to watch humpback whales and orcas, prime attractions of the area. An estimated 10,000 tourists visit the archipelago each year. Next, the group visited Farewell Harbour Lodge, a luxury resort on Berry Island. The resort operates from spring through fall each year and caters mostly to international visitors who come to view grizzly bears on the mainland and whales on day trips from the lodge. Economic development consultant, Tony Wong, describes his findings about the opportunities and constraints for tourism initiatives in the NVI plan area. Photo credit: Josie Byington. The group returned to Tsatsisnukwomi Village for a demonstration of the drone and mapping technology used by the guardians and the Nanwakolas GIS (geographic information system) technicians to monitor and map their territories. A roundtable discussion was held with the guests, guardians and hosts to discuss highlights of the day, strategies for protection of archaeological sites, tourism development ideas and data gathering techniques. The final day of the trip included a visit to Port Harvey, the site of a spill from a diesel tank on land in 2017, which was discovered by the Tlowitsis guardians on a routine patrol. The owner of the site met the group and described the clean-up process and discussed ideas for improved spill response. One of the NVI marine plan actions is the development of marine response plans. The last archaeological site visited was near Sayward in K’omoks territory. Archaeologists attempted to locate a site that was marked on old maps that appears to have been impacted by subsequent development, and the K’omoks Guardians met with the owners of the property to inform them about the purpose of the visit. Some of the participants of the NVI field orientation are seen at Tsatsisnukwomi Village. 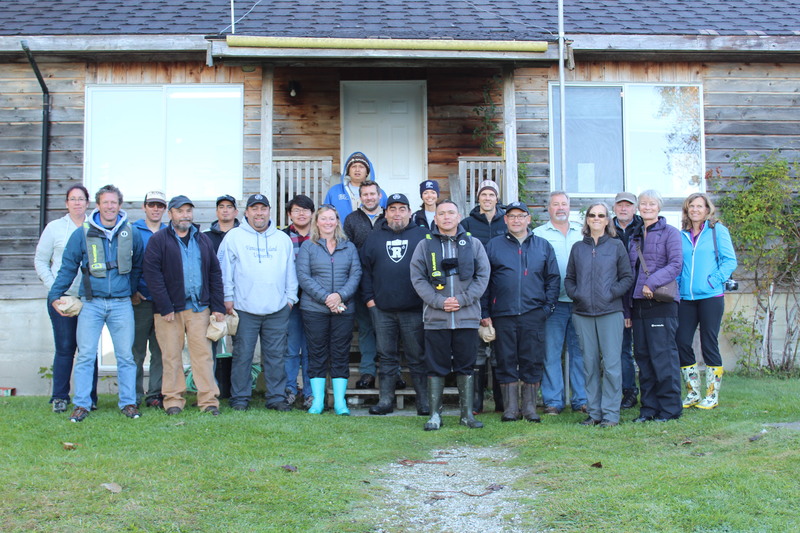 Members of the group, who were hosted by Chief Richard Sumner of the Mamalilikulla Nation, included guardians from Mamalilikulla, K’omoks, Tlowitsis and Da’naxda’xw Awaetlala First Nations, provincial government staff, Nanwakolas Council staff, consultants, and the MaPP NVI co-leads and technical support. Photo credit: Tony Wong.